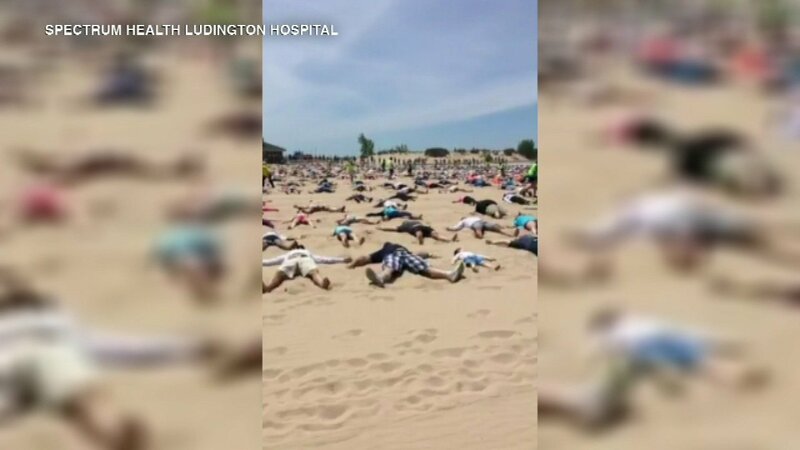 LUDINGTON, Mich. -- A western Michigan city has broken a mark set by the Guinness World Records for the most people simultaneously making sand angels at a beach. The Ludington Daily News and The Muskegon Chronicle report 1,387 people angelically assembled on a Lake Michigan beachfront in Ludington on Saturday and worked their magic for 30 seconds. That far surpasses the roughly 350 who made sand angels for 15 seconds two years ago in Pembrokeshire, Wales. A Guinness judge verified the record. The Spectrum Health Ludington Hospital Foundation organized what's been dubbed "Be Someone's Angel." The event, which had a $20 suggested donation, raised money for the hospital's cancer service center. The effort was part of "Love Ludington" weekend, which also features the opening of the Port of Ludington Maritime Museum.